Please consider this a Part 2, complementary to the In The Box Preview. This model kit is intended for the wargaming market, not for display modelers, so it cannot necessarily be judged under the same criteria. Still we should expect some degree of historical accuracy despite simplification of construction. There are three kits included in the box; for this construction review I assembled two of the kits side by side, one mostly straight out of the box and the second with some homebuilt details and extra parts stolen from some other Sherman kits. A friend commented that this kit looked like a “caricaturization” of an M4 tank. That got me thinking about reviewing it a little deeper. Second from right is the Plastic Soldier Co. M4A1(75) kit next to the comparable UM kit and Dragon kits. 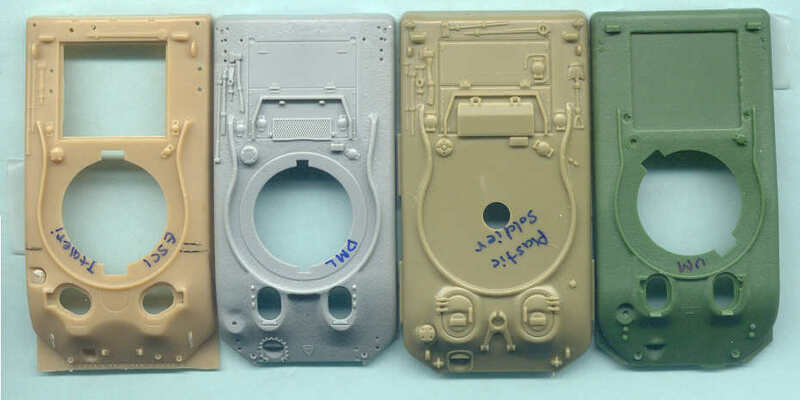 This is also a good perspective to see the overly large driver's hatches on the PSC kit, which in turn distorts the angle of the glacis and leaves no room for the periscopes and applique armor located in front of the hatches. The hull shape looks good though. 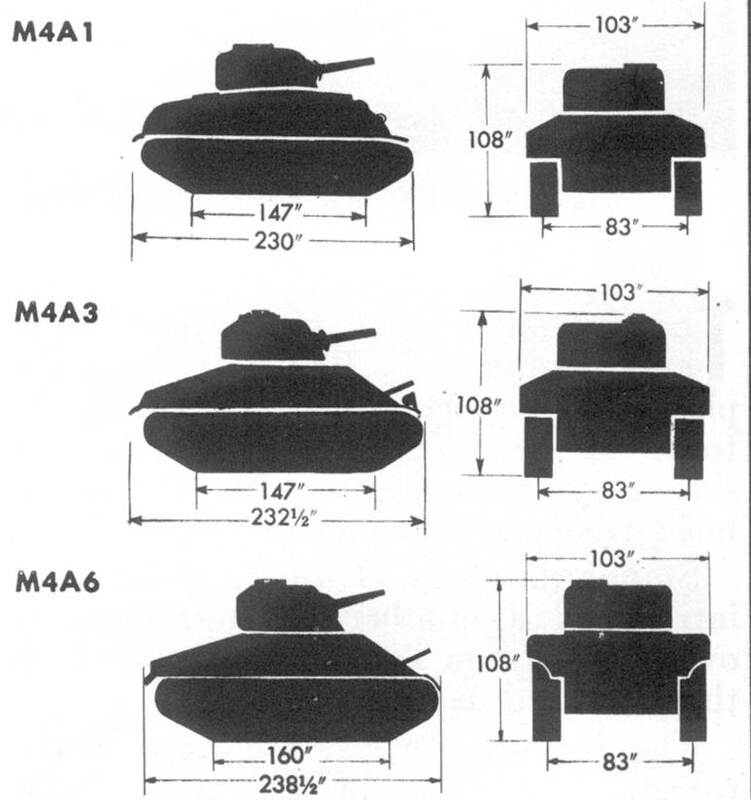 This is a scale drawing from a US Army publication I use to help determine the kit’s scale. I convert the inches to millimeters of a full size 1/1 scale M4A1, then divide these values by 72 to determine the measurements of a 1/72-scale M4A1. 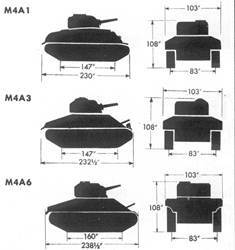 To find the scale of our model, divide the measurement of the real Sherman tank by the measurement of the model. The PSC hull in the photo above of the hull comparison appears several millimeters longer and wider than the other M4A1 hulls. Based on two measurements of my completed PSC kit my math makes this out to a 1/68 scale Sherman model, not 1/72 scale. Maybe this is also why the driver's hatches appear too big? Here is the PSC turret in the center, in between a DML and an ESCI turret. Like the Plastic Soldier Company hull the turret appears larger than the other two manufacturer's turrets; the overall shape looks good though. The PSC and DML cupolas are separate and can be modeled rotated so the hatched open front to back or to the sides like the real cupola. The PSC turret represents the initial style of M4(75) turret with no loader’s hatch, no smoke discharger penetration and with a low turret bustle. Here is the Plastic Soldier Company M4A1 kit assembled largely as intended. The hull has a nice shape and looks accurate for a cast hull Sherman except for the driver's hatches and glacis, which I discussed in the kit preview Part 1. The only significant detailing I did on this one is to thin the fenders and to cut off the lifting rings and replace them with thick copper wire. I have also scraped off the molded-on gun cradle that was located between the driver's hatches. In front of the tank is the two-piece suspension. Fit of the parts was very nice. The PSC styrene plastic was rather soft which is nice for trimming parts, but allows thin parts, like the 50-cal. machine gun barrel to easily break. The turret's pistol port is poorly shaped so I trimmed and sanded it to represent a pistol-port welded shut. The M34A1 rotor shield (gun mantlet) needed a gun sight drilled. A problem I found was that the AA mg on the turret was mounted on the turret roof rather than the commander's cupola ring and its location interferes with the hatches. My almost "out of the box" M4A1 Sherman here is to be built as a British Sherman II so a British storage box was stolen from an Italeri M4A2 kit and glued to the turret bustle. The AA machine gun has been moved to the commander's cupola ring. You'll notice that the AA machine gun barrel has been replaced with a white plastic rod after the kit barrel broke off. Sandskirts were more common with the British Shermans. Lifting rings were made from copper wire. The turret pistol port has been sanded down to represent a pistol port door welded shut. In this view we see that the hull machine gun looks too thick; perhaps is has a canvas cover on it. This series of photos covers my PSC M4A1(75) with some dressing up: scratchbuilt detailing and parts stolen from other M4 kits. The turret cheek armor and headlight guards are extras from Dragon kits. The M34 rotor shield (gun mantlet) is from UM. A sandskirt bracket with holes for bolts is from sheet styrene. A tow cable was fabricated with a teabag string soaked in white glue. An etched brass sprocket piece has been glued over the kit sprocket in an attempt to make it look better: probably not worth the effort. From this view we can see that this kit gives us a low-bustle Sherman turret. The port-side pistol port has been completely scraped and sanded off the turret side which was easier than detailing this hatch. For a short while during production this pistol port (shell ejection port) was either welded shut or completely deleted from the 75-mm gun turret. This photo shows the two Plastic Soldier Company M4A1(75) Shermans painted in Model Master olive drab but no weathering other than a pin wash in the recesses. The tracks are painted a dark gun metal color pending a little dust weathering. Decals from the Italeri wargaming M4A2 kits (British markings) at left and in US Army markings at right. 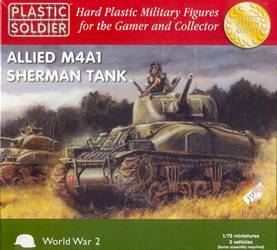 The figure in the British M4A1 (Sherman II) is the PSC kit tanker figure; the US Army tanker at right is a white metal figure. The British Sherman II, at left, has the spare 6-spoke roadwheel and length of track run (both included in the kit) attached to the glacis. Both kits have had the 75-mm M3 gun muzzles drilled out. Both kits have been weathered with Tamiya Weathering Master which is great for drybrush highlighting and looks essentially like woman’s makeup with a sponge applicator. What bothers me a little is that these kits come with the later one-piece wedge-shaped cast differential housing rather than the earlier rounded or the three-piece bolted housing. This rear view shows the features of the rear cast upper hull going straight across where actually this version (the M4A1(75)) should have a U-shape cutout on the rear; the only M4A1 that I have seen that has this feature was the M4A1(76) with the T23 turret. The US Army M4A1(75) at left has a towing pintle added, tow cable and six lashing brackets on the turret bustle (alas, I did not notice that one of these brackets had fallen off till paining was complete). Despite its simplification of details and not really being 1/72 scale, I like this kit. Fit of the parts was great, and the tracks are done well; better than with Italeri's and Armourfast’s wargaming Shermans. Best of all, the kit built quickly so I did not linger weeks on the kit, detailing and assembling a hundred small parts. The contours of the hull and turret look right, and it convincingly looks like a Sherman. It will be difficult to win an AMPS or IPMS award with it, but it is surpassing as a wargaming model. 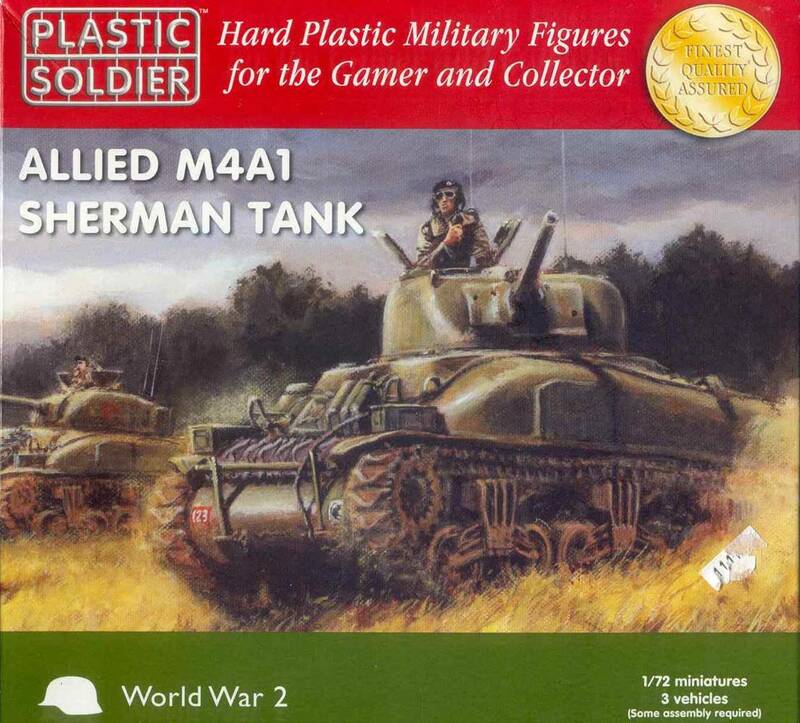 SHERMAN MEDIUM TANK 1942-1945, by Steve Zaloga & Peter Sarson, Osprey New Vanguard 3 (1993). ISBN 185532 296 X. A nice concise historical reference on the 75-mm gun armed M4 Medium tank. Sherman In Action, by Culver & Greer, Squadron/Signal Publications ARMOR No. 16 . A good, inexpensive softcover book in the noted book series geared to the modeler. Highly recommended, but unfortunately completely leaves out coverage of the M4A2 and M4A4.